Description: This is one of the first established trails at Floracliff, connecting the west and east sides of the sanctuary. It starts near a historic cabin and meanders through a field of milkweed before entering the woods and heading downslope to Elk Lick Creek. 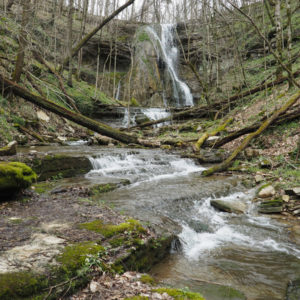 It continues up the other side of the creek, featuring the south-west facing slope, a variety of spring wildflowers, and the top of Elk Lick Falls. Named for: Bob Wilson led Floracliff as President of the board for 20 years, overseeing visitation guidelines, its dedication as a State Nature Preserve, and the hiring of the first Preserve Manager. Although retired from the board, Bob continues to share Floracliff with visitors through guided tours. His wife, Ann, who passed away in 2015, was a wildflower-lover, dedicated supporter of Floracliff, and close friend of Dr. Wharton. 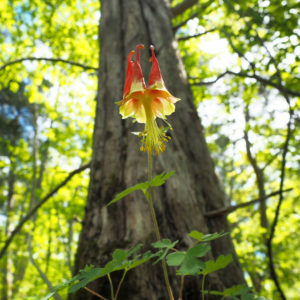 Description: Located on the northeast-facing slope of Elk Lick Creek, this is our showiest trail in spring when a diversity of wildflowers blanket the forest understory. Named for: Friend of Mary Wharton and long-time board member, Clara Es-Stel Wieland (1935-2018) was instrumental in ensuring Dr. Wharton’s wishes were carried on and spent many hours at Floracliff pulling invasives, leading hikes, and building trails. Clara was a strong advocate for environmental protection throughout Kentucky. Description: This trail begins near the Trail’s End Lodge and follows northwest- and southwest-facing slopes that are rich in wildflower diversity and mature trees. It serves the important role of connecting the original acreage of the sanctuary to the Trail’s End addition. 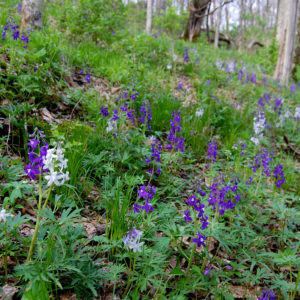 Named for: Clay Hancock served on the boards of the Kentucky Chapter of the Nature Conservancy and the Land and Nature Trust of the Bluegrass. In addition to land conservation issues, Clay worked tirelessly to support the Paris Animal Welfare Society (PAWS) and tended a magnificent flower and vegetable garden at her E-I-E-I-O Farm in Lexington. Description: Built in 2017, this trail features Floracliff’s oldest tree and and follows the contour of a steep ravine to arrive in the creek bed downstream from Elk Lick Falls. From there, the base of the falls may be viewed more closely by walking up Elk Lick Falls branch. The steep ravines along this branch create a delicate habitat for a diversity of wildflowers. 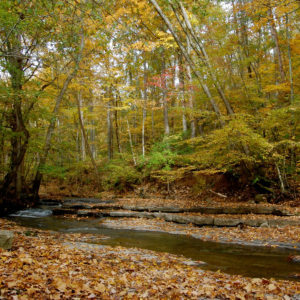 Description: This loop trail starts at the nature center and features a mostly wooded trail along the uplands, passing by three ponds, Kettle Springs, and notable plants such as blue-eyed Marys and rattlesnake plantain. Named for: A former board member, Mary Carol Cooper (1942-2016) was the director of the Salato Wildlife Education Center’s Native Plant Program for many years and led countless programs on Kentucky’s native flora and fauna, spreading her enthusiasm for Kentucky’s environment. 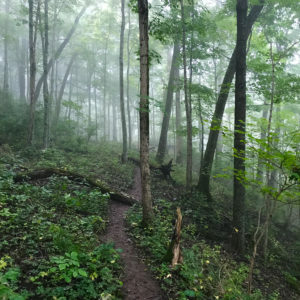 Description: The Mary DeWitt Snyder Trail passes by the historic game court of Camp Trail’s End, then meanders down a southwest-facing slope before descending steeply to the Kentucky River floodplain. The Riverside Trail parallels Elk Lick Creek, then turns to follow the Kentucky River with a magnificent view of the towering Palisades rock. 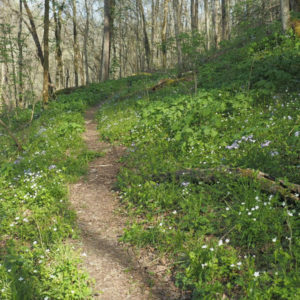 The trail loops back by the Trail’s End bluffs, showcasing robust springtime wildflowers. Named for: This trail honors the work and legacy of a woman who was well ahead of her time. Ms. Snyder was an accomplished teacher, farmer, horsewoman, and naturalist. 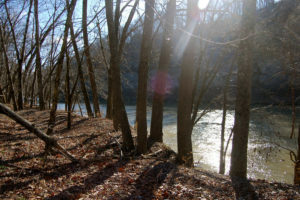 In 1913 she established Camp Trail’s End, a girls’ camp along the Kentucky River. The camp focused on producing well-rounded young women through a variety of activities including nature hikes, horseback riding, swimming, boating, archery, and rifle practice. Description: This is an old wagon road, once used for access to the floodplain where corn and tobacco were grown. Description: The paved trail is a long narrow driveway leading to the historic Trail’s End Lodge. 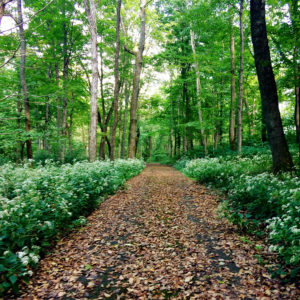 The trail features mature trees, a large pawpaw patch and a diversity of wildflowers.